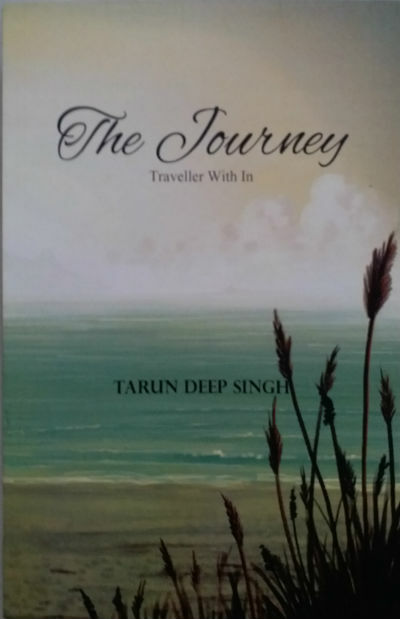 We were approached by Tarun Deep Singh with his book The Journey: Traveller With In a while ago. Unfortunately, it took longer than expected in reading the same and posting our unbiased book review for the same, as our book review queue is getting longer and longer :). Do you love reading something significant which is a little hard as it is quite realistic and require your attention? If yes, then this book is for you. No matter what is said for the book cover page philosophically, but its impact on reading and purchase decisions can’t be ignored. And that’s why, despite believing in judging a book from it’s cover is wrong, we talk about book cover almost always. The book title and the theme both are so simple yet challenging for the cover designer to come up with something attractive, convincing, and yet goes fine with the content. OF course, the cover must look decent also. We can say that the cover designer does his/her job with sincerity and imagination. An ocean bank in the front and endless ocean, clouds expanding to the horizon is perfect and that too with growing plants making their presence felt; perfectly suits for the book cover. Not very attractive or eye catcher, but decent and thoughtful, goes fine with the book theme. Usually, we distribute our book review in two clearly separate segments where in one segment we take a bird’s eye view of the book plot or story and we share our views and reviews in the second. The nature of this book, however, is quite different and thus we are weaving both these segments together. Here are a few more books which are quite similar to this one in terms of format and content. The author’s profile will not make you think at the first glance that he can be so clear in his thoughts spiritually as well. The book refers stories from mythology to the verses of Saint Kabir to references from wisdom tales and other spiritual books. Reading the book will make you admire the author for his own vast reading. And, he hadn’t just read the stuff for the sake of it, over the course of his life, but he absorbs the essence of the same and tried to share with the reader in the simple manner. Tarun is an IT professional works in Infosys. Just for your knowledge. I consider short yet informative synopsis at the beginning of every chapter, a plus point of this book. The book is spread over in 6 chapters and 5 appendixes and it has rich footnotes. It works in both the ways. On one way it makes it easy for the reader to link to references or the backstory of the point the author is trying to make, and at the same time, seeing too many footnotes, some readers may think of avoiding the book. But anyway, the book is meant for a serious reader, he/she is not going to complain about it :). It is said that “beginning makes the impression (for anything, be it a monument, a person, a book, a movie,…) which is going to last for long. This book starts with some fantastic lines in the about segment itself. Every human is a seeker of ‘Truth’. But almost all give up in the middle since they are threatened by their alter ego. Talking in detail about each chapter and good points I found in the book will contain spoilers and I want to avoid them as much as possible. So, let me give you some hints and mark some quotes from the book. Let me start with the famous verses by Sage Kabir which I have already mentioned earlier. So much is already said and written about these fantastic lines that adding something more is not needed. I personally don’t like things with a negative attitude. Because I believe that attitude is the key factor which can make/break anything. So when I saw the first chapter as “The Fallen One”, I silently hope the chapter is not what the title makes an impression of. And, I am glad that the chapter clears the center point of the same quite convincingly. The author, rightly, talks about exploring limitations and wrong aspects just because, acknowledging them will lead to the doctrines of the same and eventually help one to rise. And that is the most important thing. The analogy of “Falling one v/s Fallen one” is worth reading as well. When someone rises him/herself and keep doing it continues to be a better version of him/herself, he can eventually be the one he/she wanted to be. The following verses by Kabir explore the spirit. The author’s thoughts about heaven and hell and his discussion about things inside and outside are something you don’t want to miss. The book is quite short yet require your attention. I also found that while the author has tried infusing content in Devnagari script (possibly through Unicode) in his writing, but it leads to many typing errors. Page 18/40/82/99/106/121/… are a few references. Whether it is a printing/proofreading mistake, rectifying the same is recommended. The illustrations and scientific referenced infused in the book definitely adds to the positives of the book. They make it easier for the author to explain the things and at the same time, the reader will find it easy to understand as well. Adding some self-assessment exercises and/or questionnaire could have improved the book even more. Courage is not the absence of fear, but the ability to manage fear. It is a short yet thought-provoking book. If you want to be a better version of yourself and like to read self-help books, this will definitely interest you. This book has a specific set of target readers, it is not something to read just for fun or killing the time.